You’re home now, and only one more day before the weekend. You plop down on the couch, phone in one hand, remote in the other and start methodically scrolling through Netflix like always. Then your phone buzzes. It’s Scottie, he says the guys are going out for drinks, and you should come. You think it, but you don’t mean it. “But today was long, I need this, and it’s not that big of a deal, I’ll make it up next month.” Then you walk out the door. You might be thinking I’m about to tell you how you can save money by not going out. Or maybe I’m going to help you see why certain friends are a bad influence on your budget. You’ll be happy to know, it’s neither. I want to talk about one single word that might be causing a more significant problem than you suspect. It’s a word we use all the time, but don’t pay attention to it. I recently read this excellent article by James Clear where he pointed out the importance of the words we use when talking to ourselves. Specifically, he discussed the importance of our words when resisting temptation. 120 students were split into two different groups and asked to resist various temptations when offered. One group was instructed to refuse by saying they can’t, while the second group refused by saying they don’t. For example, if the temptation was ice cream, the first group would say “no, I can’t eat ice cream,” while the second group would say “no, I don’t eat ice cream.” After repeating this exercise over and over again, each student answered a set of unrelated questions and then turned in their answer sheet when they were finished. As each student walked out of the room, they were offered a treat as a thank you for participating. They could choose between a healthy chewy bar and a candy bar. The students who said “can’t” took the candy bar 61% of the time while the students who said “don’t” only chose the candy bar 36% of the time. It certainly seems like the words they used had a significant impact on their immediate actions. Now you might be thinking this is a fluke. After all, maybe those people just don’t like healthy chew bars. Or perhaps they still thought it was part of the study. The same researchers also looked at “can’t” vs. “don’t” over a longer period of time. For this study, they had 30 working women sign up for a health and wellness seminar. The women were divided into three groups of 10 and asked to envision a long-term health and wellness goal that was important to them. Then they instructed the groups to resist the temptation to stop while striving towards their goal. The women reported their results for the next forward days to see how many of them stuck to their goals. The results after ten days? Group 1 (control group): Only 3 out of 10 women stuck with their goals. Group 2 (can’t group): Was the worst with only 1 out of 10 remaining. Group 3 (don’t group): Had an astounding 8 out of 10 women persisting with their goals. They concluded that the words you use not only help you make better short-term decisions, but they also help you stick to your long-term goals. When I first read this, it seemed crazy. How in the world can changing one word make a serious impact on anybody’s actions? But the more I thought about it and read what James had to say, the more it made sense. The word can’t is limiting. We use that word when there’s something we want to do, but there’s an external reason or force that keeps us from doing it. A five-year-old wants ice cream, but he can’t have any because his mom won’t let him. You want to take off next week, but can’t because your boss won’t let you. I want to use a lasso to catch a fish, but can’t because it’s illegal in the state of TN. Don’t, on the other hand, is a decision we make because we believe something. I don’t cheat on my wife because I love her and believe that cheating is wrong. You don’t steal from your company because you believe it’s immoral. An Olympic athlete doesn’t stay up until 3 am the night before an event because they want to perform at their highest level. No one is stopping you or me from doing those things. Instead, we choose not to do them because of our core beliefs. If I say, no, I can’t cheat on my wife. That implies that I want to cheat, but can’t because I’m afraid she’ll found out. Instead, when I say that I don’t cheat on my wife, I’m saying I’m the type of husband who doesn’t cheat on his wife. It’s a statement about my beliefs as a human and who I want to be as a husband. The words you tell yourself are a reflection of your core beliefs and have a significant impact on your actions moving forward. Think about it. Growing up, if you were offered drugs or alcohol and you said that you “can’t.” The other kids would immediately make fun of you and say it was because you were a momma’s boy, or goody two shoes or whatever. But if you said you “don’t,” they were more likely to leave you alone and respect you. Saying you “don’t,” tells other people, you believe something and you stand behind it. A less extreme example would be sticking to a diet. Imagine a friend offers you some cake and you respond by saying you can’t have any. They immediately think that someone else is forcing you to diet. Maybe it’s a spouse, maybe a parent, or perhaps it’s just you on another health kick. But if you say, “no thanks, I don’t eat cake more than once a week,” they respect your decision. By now, you’re probably asking what this has to do with finance. In his article James focuses on applying the can’t vs. don’t concept to not missing workouts and sticking to your health goals. He applies this to telling yourself that you don’t miss workouts. When I read that article, it got me thinking of how to apply that same concept to budgeting. So starting this week, I’m going to start using don’t instead of can’t. Instead of looking at my budget like a restriction or an outside force that tells me what I can and can’t do, I’m looking at it like choices I believe in. I’m choosing to spend my money in a certain way. I’m choosing to save money in another way. When I run out of spending money, I’m not going to feel restricted and sad that I can’t spend more. I’m going to remember I chose the budget for a reason and I want to be the type of person who executes his plan. I want to be the type of person that doesn’t bust his budget. I want to be the type of person who saves money because I believe it’s essential. So What Type Of Person Do You Want To Be? Do you want to be the type of person who has their financial life together? Or do you want to be the type of person who feels restricted by what they can and can’t do? Join me in putting words behind your beliefs and not feeling restricted. Join me in putting your foot down about what you refuse to do. I’m struggling to stay on a budget just like you are. I want to change my habits, so I’m starting by changing my words. Will you change yours too? Would you like to learn more habits, tactics, and tips for choosing financial freedom? Sign up for my FREE 5 Lesson Email Course on Choosing Financial Freedom. This is interesting. I guess “don’t” feels more like you’re sticking to your principles but what backs up “can’t”? Who is tell you you can’t and what do you have to reinforce that decision? Many people can’t (or don’t?) think of anything to back that up. Great point! Exactly right! Glad you enjoyed it :)… It was a really cool way to think about it when I read the article from James Clear. Is it possible to send a personal email that everyone does not read? I just became a member today because of the Alexa money skill you post each day…my wife and I love it! Sure, you can sign up for emails from me using the box on the right or bottom of this page. Thanks Buddy, glad you liked it. Great article Nick! I came here after hearing you on the Do You Even Blog podcast. Dude, thanks! I’m so glad you came by Mike, I super appreciate it man. I had a ton of fun doing that podcast with Pete, I’m glad you enjoyed it! 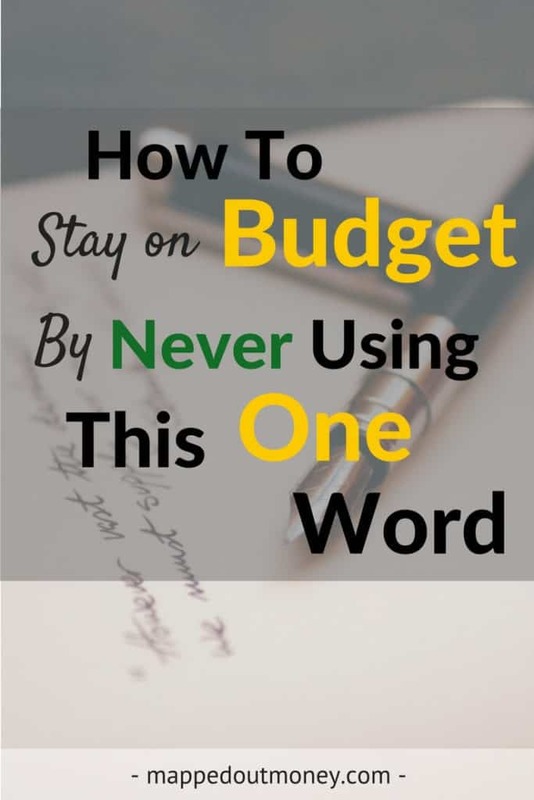 When you don’t have a budget, it’s far too easy to spend much more than you dreamed. If you don’t tell your money where to go, it will find a place to be spent. This is especially true when it comes to regular spending on consumable stuff like food, entertainment, and convenience items.